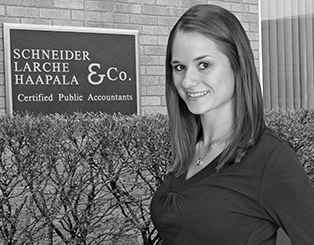 Much of Sarah's focus involves preparing individual, corporate, and not-for-profit tax returns. She also assists with audits, reviews, and compilations, as well as providing other monthly services such as payroll tax and sales tax. Sarah is a lifelong resident of Escanaba, except for the time she spent getting her education at Michigan State University. She received her Bachelor of Arts degree in Accounting, with honor, in May 2009 and went on to receive her Master of Science degree in Accounting with a Taxation Specialization, in May 2010. Sarah and her husband, Terry, moved back to the Escanaba area in October of 2011 when she began working for SLH. © 2019 Schneider, Larche, Haapala & Co PLLC All Rights Reserved.